I don't know if I've admitted it before, but I love my snacks. I'd rather have a couple of light meals that one big one. Back in Bombay, this is very easy to do. We have such a wide variety of snacks from various parts of India. Most of them are readily available at street food carts or other grocery stores and they don't cost the earth. Most of these snacks are savory. After coming to Australia, I often find myself craving this ever so delicious street food. And here, its almost impossible to find these treats as easily as you find it Bombay. If you do find them, they are ridiculously expensive and a lot of times they disappoint. Given these reasons, I try to make some of these delicious snacks at home. Some I am familiar with making, the others I'm trying to learn. Today's post is about one such recipe. Its a cake recipe, but not your regular, run of the mill cake. This is a savory one. And it is made with chickpea flour. 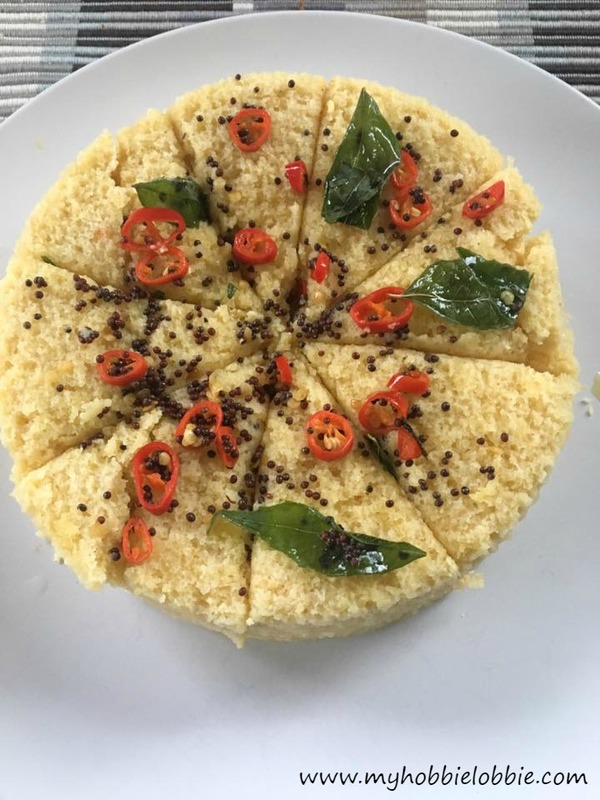 It is called Khaman Dhokla and happens to be one of my favorite street foods. Even though I enjoy this recipe, I didn't know how to make this one. I had to do some reading before I could find a recipe I was happy with. And when I saw this instant recipe, I knew I had found the one. Traditionally, this cake is steamed, but this is a microwave recipe. This beautiful snack comes together in less than 30 minutes from start to finish. It is absolutely delicious. The cake itself is light and super fluffy. The flavors are well balanced and in all, very moreish. If you've had dhokla before, you probably love it as much as I do. If you haven't, you really should give it a try. It is a unique treat and you won't be disappointed. This treat is served with some Green Mint Chutney and some Tamarind & Date Chutney. You can buy little bottles of the chutneys at any Indian store or click on the links to find the recipes, if you'd like to make some at home. They are very easy to make and taste so much better. Either way, these chutneys are an important part of the dish and not just an accompaniment. Serving it without the chutneys doesn't do the the dhokla justice. In a large mixing bowl, mix the besan, semolina, asafortida, sugar and salt. Add the chilly and ginger paste to the mixing bowl. Add the oil and citric acid. Add the water and mix everything till well blended. Whisk the batter well to incorporate air into it. It will make a light and fluffy dhokla. Add the eno (fruit salts) and whisk the batter till it is well incorporated. The batter will get light and frothy. The batter should be of thick dropping / pouring consistency. Cook for 5-6 minutes. It may take longer depending on the microwave. Take it out and insert a toothpick to check if it is done, just like you would a regular cake. If the toothpick comes out clean, it is cooked and if it doesn't microwave for another 30 seconds. Traditionally, it is cut into squares. But I tried cutting it into wedges this time and it looks much prettier this way. In a pan, heat the oil. Lower the flame and add the mustard seeds and green / red chillies and let it sputter. Add the curry leaves and let it fry up on low heat till crisp. When they are crisp, add the sugar and water. Mix well. Pour the hot tempering over the dhokla. Serve with the Green Mint Chutney and Tamarind & Date Chutney.